This outdoor wall sconce will update the exterior of your home with its eye-catching design. Featuring a black finish and clear beveled shade(s), this fixture will accommodate a variety of outdoor of dicor styles. With its easy installation and low upkeep requirements, this outdoor wall sconce will not disappoint. Globe Electric's Miller 1-Light Outdoor Wall Sconce is the perfect way to bring old world charm into your life. The lantern shape of this piece is accented by a clean black finish and topped off with beautiful watered glass panes to finish the vintage yet modern look. Adding a Globe Electric vintage inspired bulb will complete the look. The Miller Wall Sconce is a standalone piece however, you can give your entrance complete symmetry by hanging two of these stunning pieces. Includes all mounting hardware for quick and easy installation and requires one E26/medium base 60-watt bulb (sold separately). 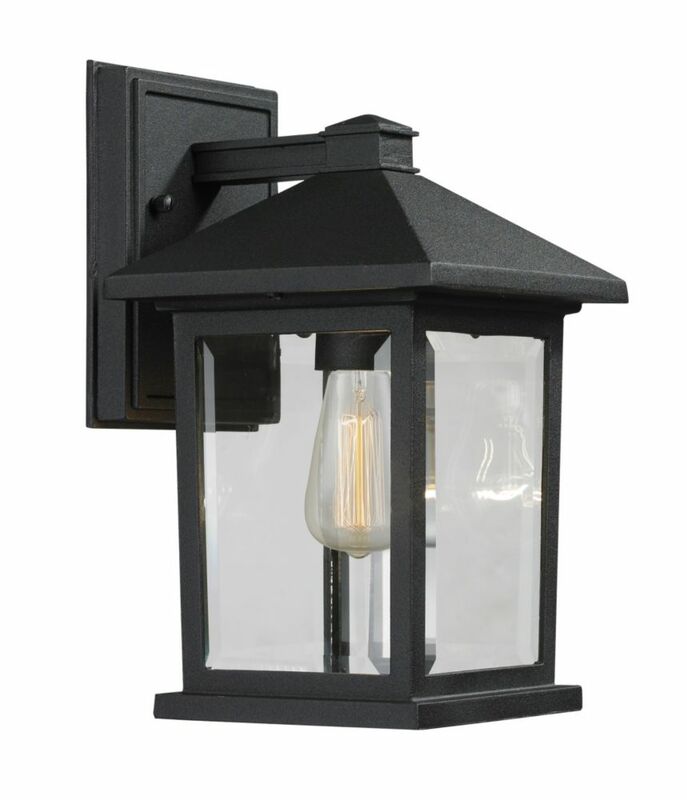 1-Light Black Outdoor Wall Sconce with Clear Beveled Glass - 7.125 inch This outdoor wall sconce will update the exterior of your home with its eye-catching design. Featuring a black finish and clear beveled shade(s), this fixture will accommodate a variety of outdoor of dicor styles. With its easy installation and low upkeep requirements, this outdoor wall sconce will not disappoint.